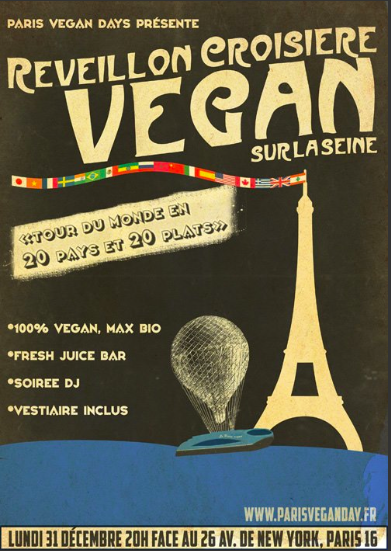 Vegan New Year’s Eve Cruise on the Seine! Have you been looking for the highlight of your life? I think this may be it: Gentle Gourmet restaurant and Paris Vegan Days association are uniting to host the 2nd Annual New Year’s Eve cruise on the Seine. The cruise commences at 8pm on New Year’s Eve, boarding the boat at Port Debilly by the Trocadero. The theme is “20 countries in 20 dishes” and as you cruise by the beautiful sights, enjoying the open bar, fresh juice bar and DJ you’ll be eating an amazing assortment of 100% vegan, “max bio” food. Check out the menu and other details at http://www.parisveganday.fr or Gentle Gourmet’s Facebook page where reservations can be made. Purchase before December 6 and tickets will be 109€, after that they’ll be125€ (Tickets can be purchased via PayPal to tresorier@parisveganday.fr or by check. All twenty items sound delicious but the one that is most on my mind is the Chocolate Vanilla Eclair dessert. Miam!